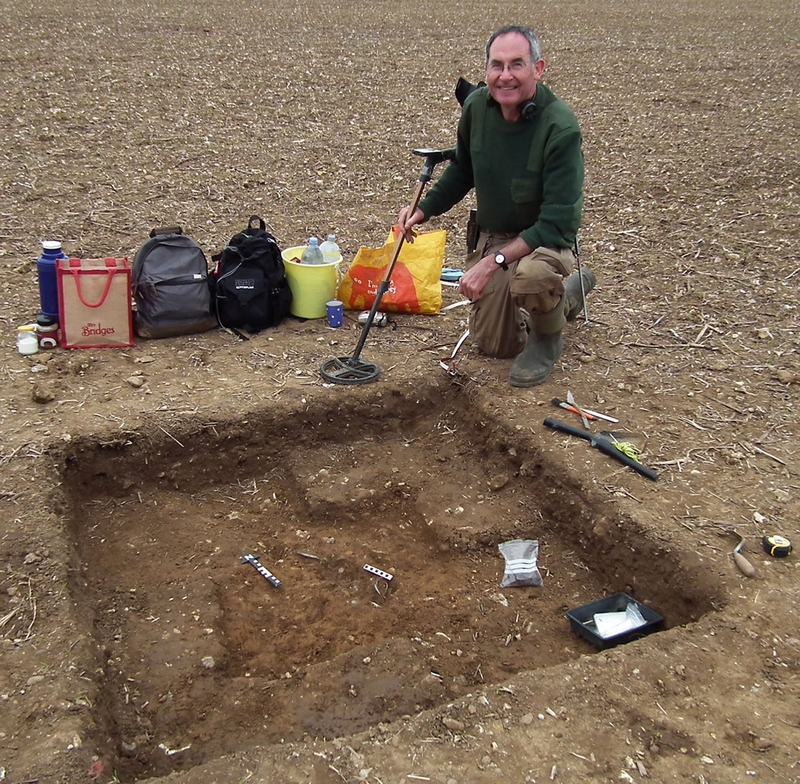 A mixed hoard of Viking jewelry and Anglo-Saxon coins has been unearthed in a farmer’s field near Watlington, Oxfordshire. 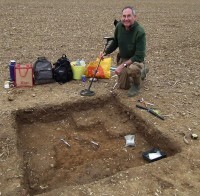 It was discovered in October by metal detectorist and retired advertising executive James Mather. He was about to close up shop for the day when he found a cigar-shaped object that looked a lot like the Viking silver ingots he remembered seeing at the British Museum. He dug nine inches down and saw a group of coins. 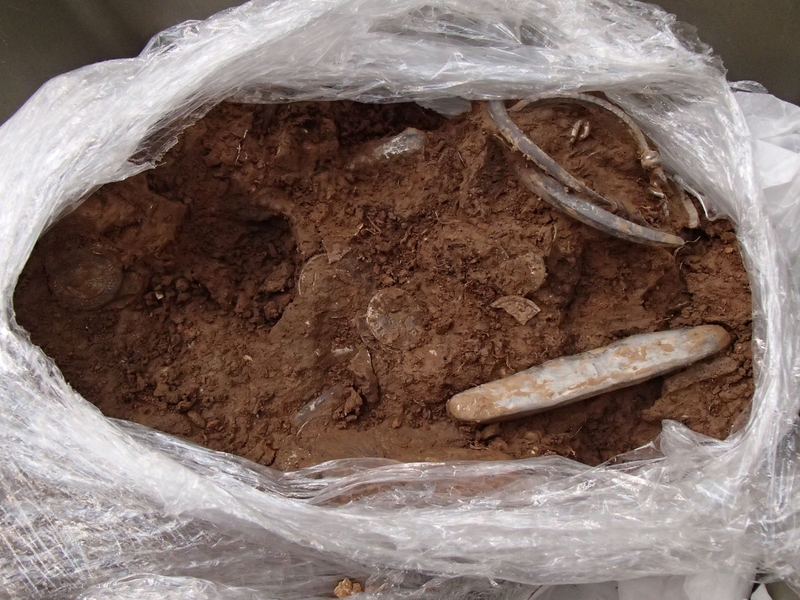 Instead of continuing to root around, he wisely called the local finds officer for the Portable Antiquities Scheme (PAS) who told him to rebury the objects until they could be formally excavated. An anxious weekend passed with Mather repeatedly returning to the field to make sure nobody was messing with the treasure. When PAS archaeologists arrived Tuesday, they excavated the find with Mather’s help. It was his 60th birthday. (I pity his loved ones because it’s going to be virtually impossible to top that gift for the rest of his life.) The archaeologists removed the hoard in a block of thick clay soil so it could be fully excavated in laboratory conditions. They had the landowner get high quality plastic wrap to encase the block and placed it on a baking sheet also borrowed from the farmer. Finds officer David Williams brought the wrapped hoard to London in a suitcase, causing some consternation at the British Museum where suitcases aren’t welcomed to roll down the halls, hoard or no hoard. 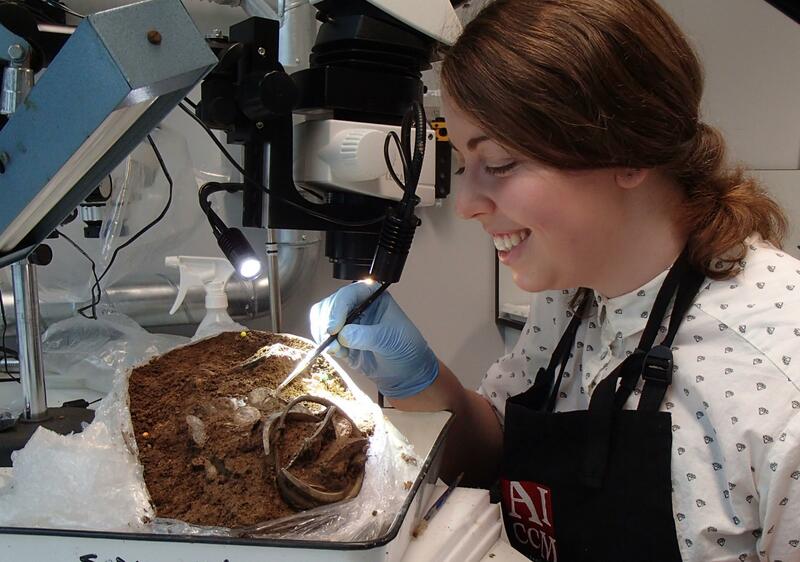 Safe in the museum lab, the treasures were cautiously excavated from the clay by conservator Pippa Pearce. Her work quickly confirmed the wisdom of the excavation method because some of the coins were so thin they couldn’t even be held by the edges lest they warp. 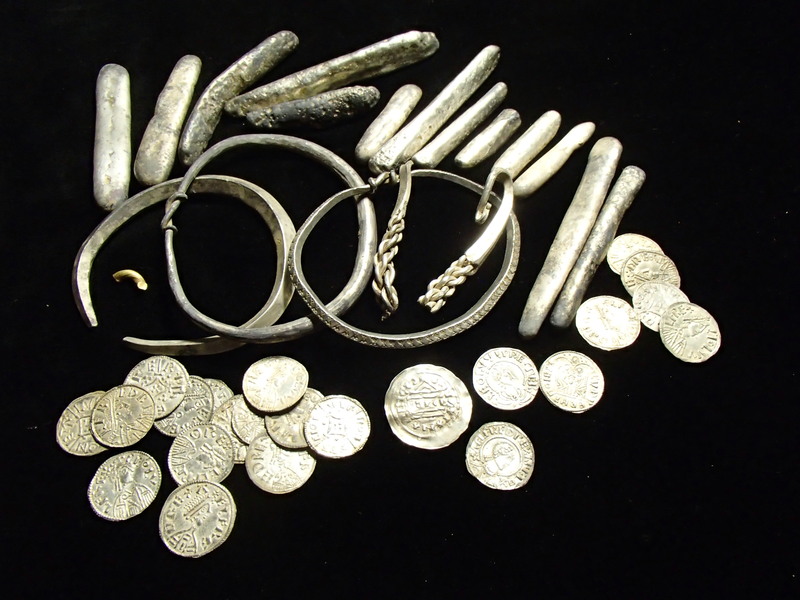 The finally tally of the hoard was 186 coins, some of them fragments, three silver bangles, probably arm rings, four pieces of broken jewelry and 15 silver ingots. 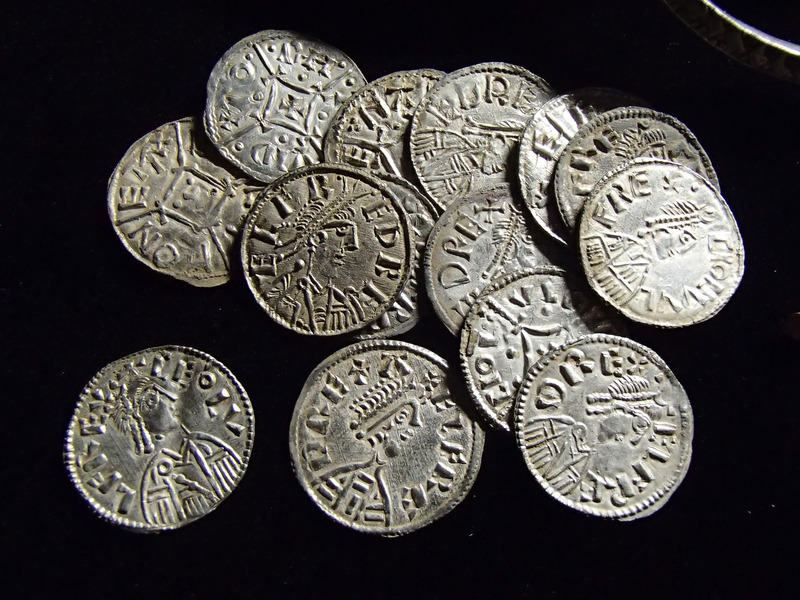 The coins are all Anglo-Saxon; the silver and jewelry Viking. There is also a little twisted off scrap of gold which is the first found in a Viking hoard in Britain. 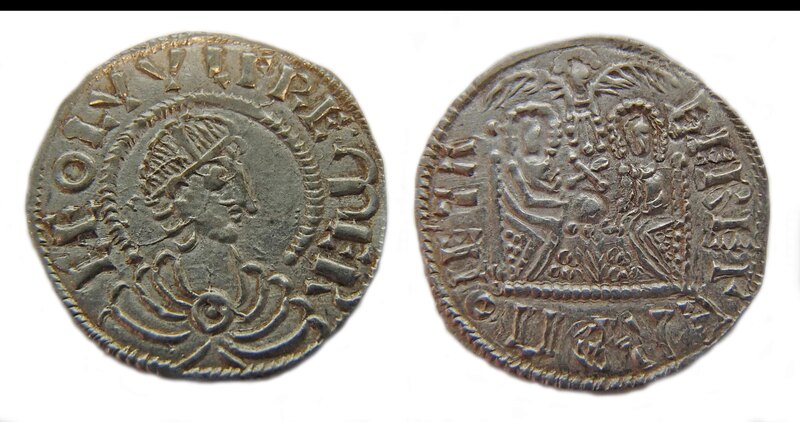 The coins were issued by King Alfred the Great of Wessex (r. 871-99) and King Ceolwulf II of Mercia (r. 874-79). Archaeologists believe the hoard was buried in the late 870s, around the time of Alfred’s final defeat of the Viking Great Heathen Army in the Battle of Edington in 878. The coins may rewrite the history of the collaboration between Wessex and Mercia during this time. Ceolwulf II was the last independent king of Mercia. Very little is known about him. He is included in the Worcester regnal list of Mercian kings which puts his rule at a mere five years, from 874 to 879. The Vikings had conquered eastern Mercia by that point, leaving Ceolwulf control of western Mercia which consisted mainly of the Diocese of Worcester (today’s Worcestershire minus its northwestern tip). The Anglo-Saxon Chronicle, commissioned by Alfred the Great, is disdainful of Ceolwulf, accusing him of being a Viking lickspittle. And the same year [874 A.D.] they [the Great Heathen Army] gave Ceolwulf, an unwise king’s thane, the Mercian kingdom to hold; and he swore oaths to them, and gave hostages, that it should be ready for them on whatever day they would have it; and he would be ready with himself, and with all those that would remain with him, at the service of the army. This is likely revisionism courtesy of Alfred’s desire to expunge his connection to Ceolwulf from the historical record. There are surviving charters and land grants witnessed by Mercian nobles and clerics which refer to Ceolwulf as “Rex Merciorum.” This suggests he had some measure of genuine control over his territories and was accepted as king. The Mercian ruling class, ecclesiastical and lay, recognized Ceolwulf II as the legitimate king of Mercia, not an “unwise king’s thane” borrowing the land until such time as his Viking masters decided they wanted it. The fact that he issued coinage also indicates he held real power, especially since two of the three types of surviving penny were co-issued by Alfred. There are examples of both of those types — the Two Emperors and the Cross and Lozenge — in the Watlington Hoard. 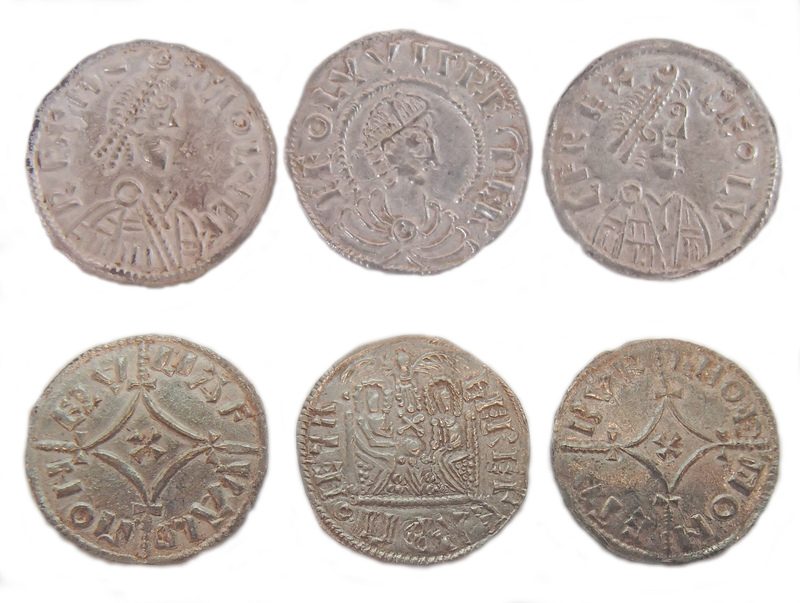 These are very rare coins, and the examples in the hoard are of particular historic significance because they were struck in different mints over several years. Previously extant Two Emperors and Cross and Lozenge coins were issued the same year. The newly discovered coins are proof that Alfred and Ceolwulf were allies and worked closely together at least in the arena of currency reform for more than one year. Gareth Williams, curator of early medieval coinage at the British Museum said: “This is not just another big shiny hoard.” He said it was evidence about a poorly understood time in the development of England. Even the scrap of gold, chopped up to use as currency by weight, shows the emergence of a gold standard. The coins, he said, offered insight into a coalition that broke up acrimoniously after a few years, leading to one partner disappearing without trace. “They give a more complex political picture of a period which has been deliberately misrepresented by the victor.” He added, diplomatically, that the relationship of Stalin and Trotsky came to mind. There is no more information about Ceolwulf II in the historical record after 879 A.D. and certainly by 883 he was no longer in power. His successor was Æthelred, no longer a king but a lord ruling Mercia as a vassal of King Alfred. This defining period in English history is the subject of a popular BBC series called The Last Kingdom. It’s on BBC Two in the UK and BBC America in the US. I’ve seen the first season and it is outstanding. It’s based on Bernard Cornwell’s series of historical novels The Saxon Stories and while he was not involved in the creation of the series, he’s an avid watcher and has nothing but good things to say about it. As do I. Character development that makes sense. Battle scenes where you can actually see things happening clearly without giving up a sense of dynamic movement. Brilliant cast. Historically accurate sets. It’s as good as it gets, imo, when it comes to televised historical fiction. This entry was posted on Friday, December 11th, 2015 at 5:43 AM	and is filed under Medieval, Treasures. You can follow any responses to this entry through the RSS 2.0 feed. You can skip to the end and leave a response. Pinging is currently not allowed. And I am also watching, and enjoying, “The Last Kingdom”. I hope they will make more seasons. A fascinating finds! The co-issued coins are particularly interesting, especially if they were struck over quite a few years. The historical records from Alfred’s reign are usually considered helpful, but here’s proof that they can be hugely problematic as well. Thanks a lot for this article- the best I’ve read on this find so far. What a find your blog is. I’ve only just discovered it and so much to catch up on. Off to hunt for The Last Kingdom here in the States. Love that book series. Cheers.